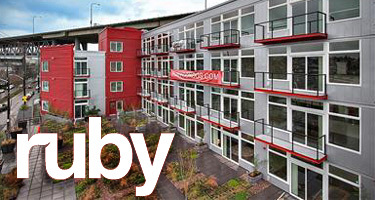 The Ruby Condominium, located in Seattle’s Eastlake neighborhood, announced they’re now over 60% sold. They’ve also lowered prices and is FHA approved. HOME #108 was $399,990, just reduced to $309,500! 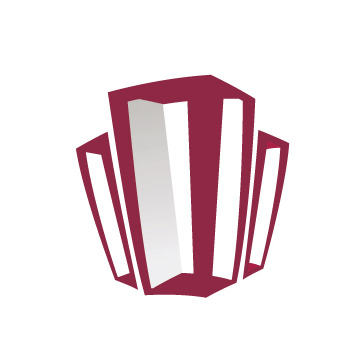 801 sf. 1 bed/1bath. Views are spectacular from living room and large ground floor patio surrounded by large landscaped courtyard. 9’ ceilings, smooth and attractive slab granite counters throughout, hardwoods in entry, kitchen and living room. Home 108 is a ground floor home with spacious and comfortable patio surrounded by lush and colorful landscaping throughout the courtyard. HOME #111 was $349,990, just reduced to $309,500! 801 sf. 1 bed/1bath. Ground floor home. 9’ceilings, smooth and attractive slab granite counters throughout, hardwoods in entry, kitchen and living room. Cozy and spacious outdoor patio surrounded by lushly landscaped courtyard has sweeping views of Lake Union and surrounding area. HOME #408 was $399,990, just reduced to $335,500! 801 sf. 1 bed/1bath. Sunset and Lake Union views are stunning from living and terrace. 9’ ceilings, smooth and attractive slab granite counters throughout, hardwoods in entry, kitchen and living room. Home 408 is a top floor home with spacious and comfortable terrace looking down to lush and colorful landscaping throughout the courtyard. 934 sf. 1 bed/1bath. 9’ ceilings, large bedroom, and large private deck. Smooth and attractive slab granite counters, hardwoods in entry, living and kitchen. Faces north and west from private terrace off living room. 718 sf. 1 bed/1bath. Unique corner home with convenient area off entry that can be used for a desk or small office area. Home faces north and west overlooking beautifully landscaped courtyard, with dramatic views of Lake Union and surrounding area. 9’ ceilings, smooth and attractive slab granite counters, hardwoods in entry, kitchen and living. 801 sf. 1 bed/1bath. Views are spectacular from living room and large private deck! 9’ ceilings, smooth and attractive slab granite counters throughout, hardwoods in entry, kitchen and living room. 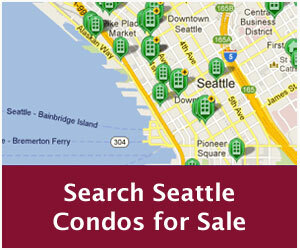 Great price for 3rd floor home with large terrace and sweeping views of Space Needle and Lake Union! All homes include one garage parking and storage. 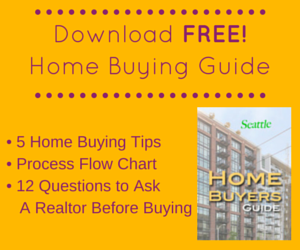 FHA, low-down financing available through Seattle Mortgage. Dimensions are as per the “as built” survey in the POS. Prices and terms are subject to change without notice. View available Ruby condos for sale.